Every day people across Connecticut put one foot in front of the other quite literally as they go about their lives. Or, in the figurative sense of the expression as those down on their luck struggle to carry on. With the economy slow to recover from recession and the latest news out yesterday that America’s middle class is not only diminishing but has lost ground in terms of income – no longer the world’s wealthiest – it should come as no surprise that the number of families and individuals unable to put food on the table continues to rise. Increasing numbers of Americans are living paycheck to paycheck, or, with the breadwinner laid off are without a paycheck. 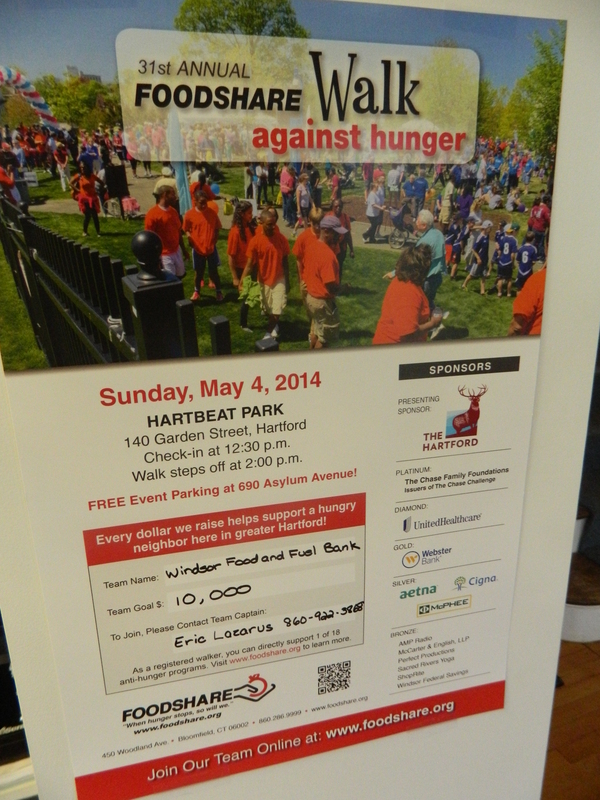 On Sunday, May 4 comes the opportunity to help neighbors who do not have enough to eat by participating in the 2014 Foodshare Walk Against Hunger. Online registration is open to take part as a walker or to become Captain of your own Walk Team. The two mile noncompetitive walk is slated to kick off from Hartbeat Park, 140 Garden Street in Hartford and will make its way around Bushnell Park. Check-in starts at 12:30 p.m. and the walk will step off at 2:00 p.m.
“Every dollar raised allows Foodshare and its benefiting partner programs to provide support for those families struggling to put food on the table – and, just as important, to help them get back on their feet so they don’t have to wait in line for food assistance,” Jordan Nyberg of Bloomfield-based Foodshare, stated in a press release. According to Nyberg, more than 128,000 people in Hartford and Tolland counties are seeking help. If this year’s Walk Against Hunger reaches its goal of raising $650,000 it means Foodshare will be able to continue serving those in need, she noted. Last year, some 4,000 participants raised $638,000. Recent donations from groups such as Ocean State Job Lot Charitable Foundation’s “Three Square Meals” community assistance program and the Caterpillar Foundation have made a difference. But the statistics are staggering. Data provided by Nyberg from the USDA shows 49 million people in the United States, 16 million of them children, are what Foodshare describes as “food insecure” – uncertain where their next meal will come from. “Solving hunger is an enormous task, and it requires involvement from the entire community,” says Gloria McAdam, Foodshare President & CEO. For information about making a donation, or participating in the upcoming 2014 Walk Against Hunger visit the Foodshare website http://www.foodshare.org. Be among those to put one foot in front of the other to help feed the hungry in America.